Intriguing Fire Agate is a wonder of the mineral world. How it derives its name will be obvious on first sight, as a good specimen will seemingly smolder and glow with light, reminiscent of a glowing ember. Some specimens reveal a scattering of points of light that together resemble a snapshot of a far-away nebula, or galaxy of stars. Fire Agate is a microcrystalline quartz variety of chalcedony containing traces of limonite (plate-like crystals of iron oxide). Formed through hydrothermal activity, hot water infused with silica and limonite long ago invaded cavities in subterranean rock. As the solution cooled, chalcedony began to crystallize in the rock cavities. The chalcedony continued to crystallize in layers, in a botryoidal formation (like a bunch of grapes), interspersed with limonite. Light, which reflects off a specimen of fire agate, experiences interference because of the layering of chalcedony and limonite. The light is diffracted through the layers and platelets, breaking into its separate frequencies and revealing the different colours of the light spectrum. Chalcedony, which makes up the bulk of fire agate, is generally colourless, white or grey – it is the presence of iron oxide in the mix which causes the characteristic brown base colour of fire agate. Within fire agate one may see either flashes of vivid, coloured light or, if the small botryoidal formations in the stone are still whole, a scattering of what appear like little stars. Generally the flashes and points of light will be gold, red and green, but occasionally blue and violet are also present. Generally, specimens of fire agate will be uneven and undulating when cut by a lapidarist. It is important to cut away the outer layers of chalcedony, but to leave the botryoidal formations intact. Cutting too far into these formations will destroy the iridescent effect, but leaving too many outer layers will cause the stone to appear dull. 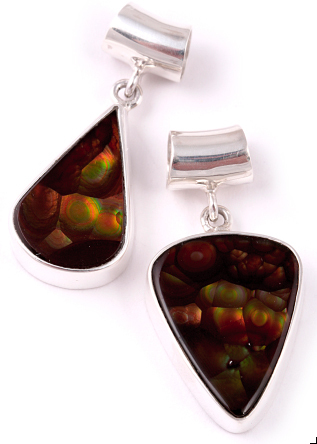 This is why fire agate cabochons tend to be very abstract and somewhat lumpy. Fire agate, which stimulates the 1st, 2nd and 3rd chakras, provides energy, courage and grounding for one’s presence in the world and provides the impetus required to work at ones peak. It helps to remove creative blocks and enhance creative visualization, making it a powerful aid for manifestation. Fire agate stimulates physical and sexual energy, meaning it may have applications in overcoming lethargy, impotence and fear of sexual intimacy. It is said to dispel ones deepest fears, to clear the emotional element of ones problems, and help one to be decisive in the face of uncertainty. For the spiritually inclined with a tendency towards being ungrounded, its stimulatory effect on the lower chakras is particularly beneficial, as its emphasis is on action. It creates a passion for life and activates the senses, serving well those who have difficulty dealing with the physical reality of life on Earth. As a protective stone, fire agate will reflect negative intentions back to their source, in such a way that the source will learn from the experience. It is also said that it will curb the tendency to gossip! In terms of physical healing, fire agate is said to heal the circulatory and central nervous systems. It is also credited with enhancing clarity of sight and improving night vision. 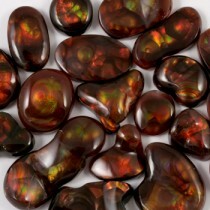 Fire Agate relates to the astrological sign of Aries and vibrates to the number 9.